An exciting new development of 3, 4 and 5 bedroom homes on the outskirts of Stafford, a county town famed for its rich heritage and ancient buildings. Sitting in a convenient location just 3 miles from Stafford offering excellent shopping, health and education facilities yet just a short drive away reaching an area of outstanding natural beauty, Cannock Chase. 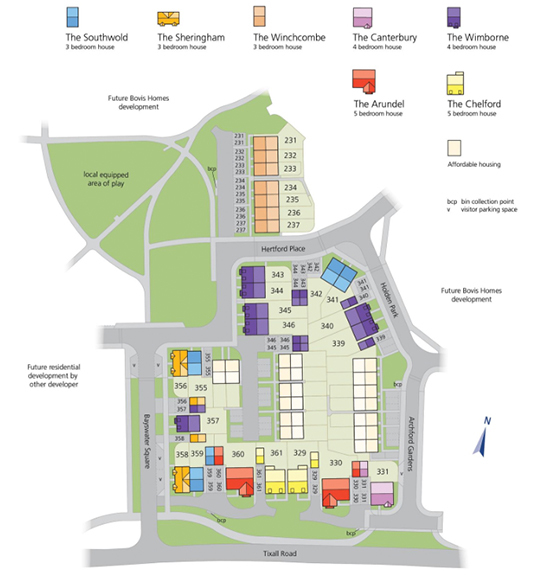 As you would expect Bovis Homes is creating a development of highly desirable homes in a perfect location. Prices on these desirable houses in this fantastic location start from £204,995. St Mary's Gate is within easy reach of the A518 one of the town's major trunk roads. Junction 14 of the M6 is about five miles away from which you can head north to Newcastle-under-Lyme and Junction 13, just over five miles, takes you south to Wolverhampton and Birmingham. The town's railway station is three miles from St Mary's Gate and provides links to all major UK cities, including Birmingham, London and Manchester. For air travel Birmingham International Airport is approximately forty miles away and Manchester Airport 53 miles. Stafford's attractive town centre boasts many shops, boutiques, bistros, restaurants and pubs. The popular Guildhall Shopping Centre in the heart of the town has more than 40 retailers under one roof including leading brand names and smaller independents as well as Stafford's Market Hall. The nearby High Street has both leading department stores and smaller local shops. There is also a choice of supermarkets in the area and for serious city shopping Birmingham's Bullring Centre is only thirty miles away with more than one hundred and sixty shops and twenty five restaurants all under one roof. Stafford is famed for its impressive array of historic buildings and pretty places to visit. The Ancient High House is said to be the largest timber-framed house in England and Stafford Castle dates back to 1090. The town has its own Leisure Centre, Gatehouse Theatre, Gallery, Cinema, golf courses and skate park. It's also a great place for walks with the pretty River Sow running through scenic Victoria Park and the Staffordshire and Worcestershire Canal within easy reach. Less than five miles away is the National Trust-owned Shugborough Hall, while Cannock Chase, an Area of Outstanding Natural Beauty, is only a short trip from St Mary's Gate. For young pupils St John's Church of England Primary School is less than two miles from St Mary's Gate and St Leonard Primary School is about three miles. For senior pupils Weston Road High School is less than a mile away and Stafford College approximately three. Walton High School is a specialist science school and The Weston Road Academy is a sixth form centre. Stafford Grammar offers independent education. For more information on any of the upcoming Bovis properties please contact our Stafford branch on 01785 255800 or email us.